If those 30-inch LCDs we showed you are too big of a stretch for your budget, Soyo's GoVideo Dual LCD line might be just what you need. The twins are all decked out with built-in speakers, 2,560x1,024 resolutions, and 8ms response times. But what's extra cool is that the displays can be turned so that both their derrieres face each other (this can come in handy if you want someone to see what you're doing without them breathing down your neck). The 17-inch GVLM1728 will go for $999 while its bigger 19-inch brother, the GVLM1928, will go for $1,199. Having a dual-monitor set up is addictive once you've tried it and at just under a grand, the GVLM1728 is a quick way to gain some extra screen real estate. 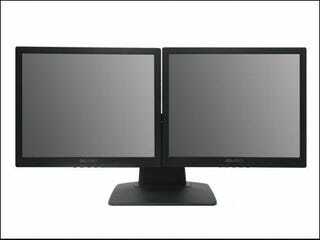 Click through to see the monitors aligned back to back.